4422 ✉ 14B 1 Sgr. 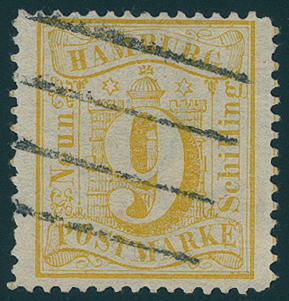 Yellow, rouletted in lines 12, wonderful having bright colors outstanding quality with complete roulette on all hands on very nice cover with pricked clear number postmark \"9. 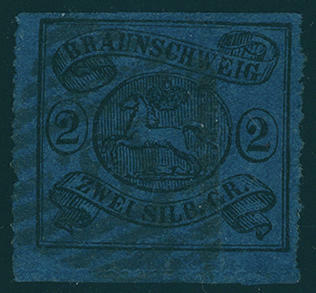 \" and additional two ring cancel \"Brunswick 23. 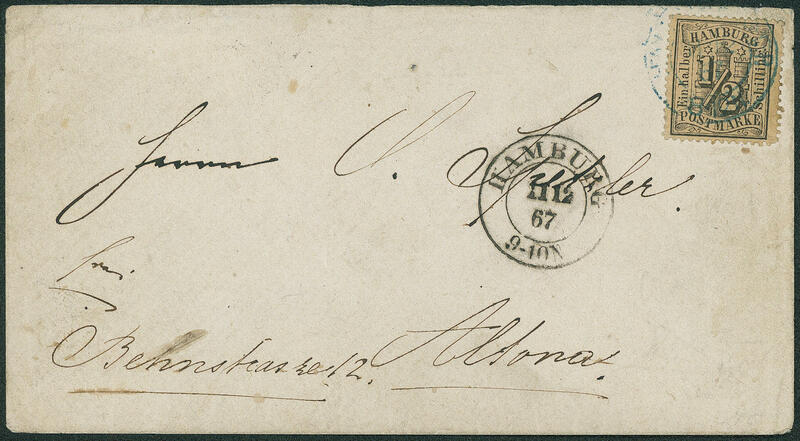 November 1864\" to Trendelbusch. One of the most beautiful known single frankings of this rare issue for the highest standards! Expertized Pfenniger, photo expertize \"genuine and immaculate\" Walter angel BPP, photo expertize \"perfect quality\" long BPP. 4423 ⊙ 15Pa 2 Sgr. Black on dark blue, three sided good rouletted, above scissors separation, fresh colors with extremely rare variety \"glued paper web\", neat cancelled with Nrs. \"19\". A spectacular classic varieties rarity, which also in the Michel special catalogue unlisted is. Photo expertize long BPP. 4426 ⊙ 5b 4 Sch. 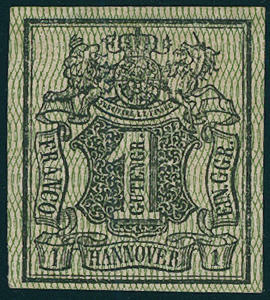 Bluish green, wonderful fresh colors and large margins all around with clean mounted bar cancel, from the left sheet margin. An outstanding quality this Hamburg rarity! Photo expertize \"perfect quality\" long BPP. 4427 ⊙ 5b 4 Shilling bluish green, wonderful fresh colors and large margins all around, left and right with intermediate lines, clean mounted four stroke cancel. An outstanding quality this Old Germany rarity! Photo expertize \"perfect quality\" long BPP. 4428 ⊙ 7 9 Shilling orange yellow, fresh colors and large margins all around with centric and especially clear mounted bar cancel. An outstanding quality for the highest standards! Photo expertize \"perfect condition\" Jakubek BPP. 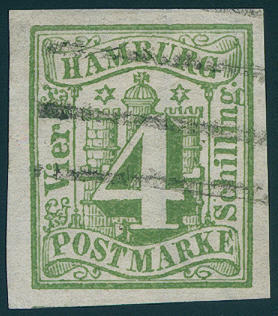 4429 ⊙ 8bI 1 ¼ Shilling green gray with very scarce plate flaw \"fraction line above with piston extension\", which only on field 5 occurs, fresh colors and large margins all around with Danish three ring postmark \"2\". 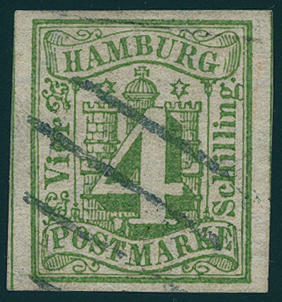 Of an of the most beautiful known examples this Hamburg rarity for the highest standards! Photo expertize \"perfect quality\" long BPP. Michel 2500,- €. 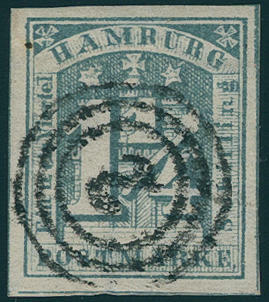 4430 ✉ 10 1 / 2 Shilling black, fresh colors and well perforated on cover with blue two ring cancel \"Hamburg ST. P. 11.12.67\" and additional black two ring cancel \"Hamburg 11.12. \" to Altona. 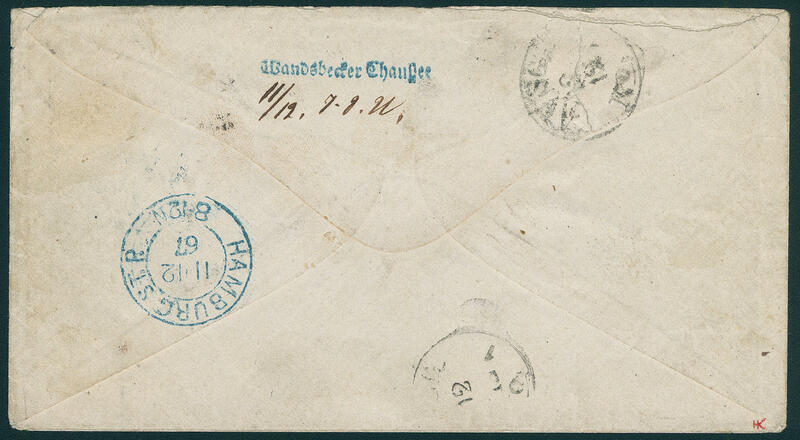 Reverse carries the cover the extremely rarely blue single line cancel \"WANDSBECKER avenue\" with handwritten date and time \"11.12.7-8 N\", as well posting and arrival postmark. 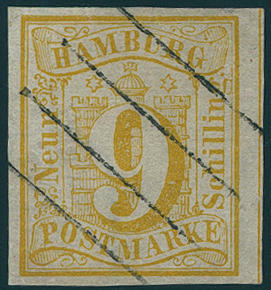 It is a matter herewith about the by a long way rarest and most precious postmark from Hamburg. There are only three further covers from this known. 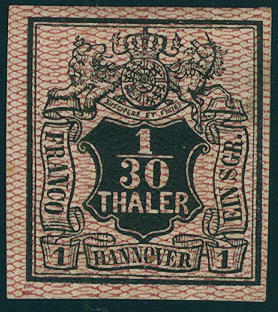 Another document hereof obtained in the nineties years on a Hamburg auction a surtax price from 72000,- DM. Photo expertize long BPP. 4432 ⊙ 18 9 Sch. Yellow, fresh colors and very well perforated with clean mounted black four stroke cancel in perfect quality. An outstanding quality this Old Germany rarity! Photo expertize \"perfect quality\" long BPP. 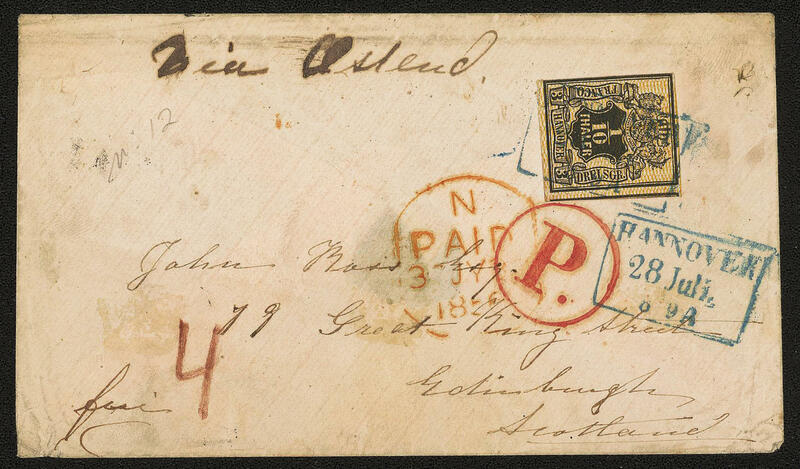 4433 ⊙ 18 9 Shilling yellow, wonderful fresh colors and very well perforated with clean mounted five line cancel. An outstanding quality this Old Germany rarity! Photo expertize \"genuine and faultless\" Jakubek BPP. 4434 ✉ \"Hamburg TH. 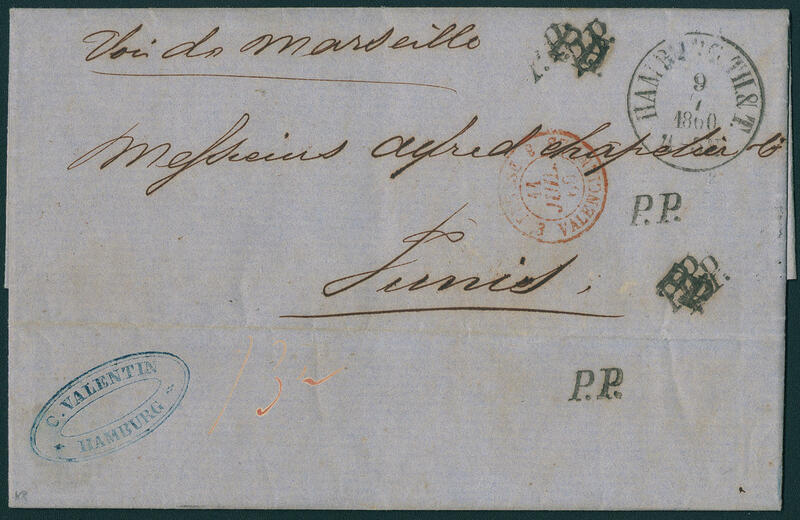 & T. 9.7.1860\", clear on bar stamped cover to Tunis / Tunisia with additional one-line cancel \"P. D. \", over stamped through \"P. P. \", red border transit postmark and transit cancellation \"MARSEILLE 12. July 60. \" and arrival postmark \"TUNIS 19. JUIL. 60. \". 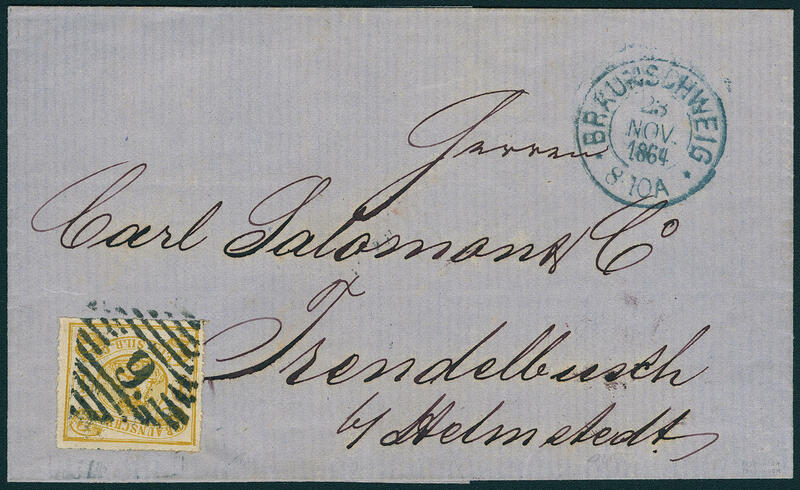 Classic letters from Hamburg to Africa used are extraordinarily rare! 4435 ✉ \"Hamburg 11. OCT. 1856. \", butterfly stamp on cover with content to Victoria / Australia with transit stamp, over liverpool transported. 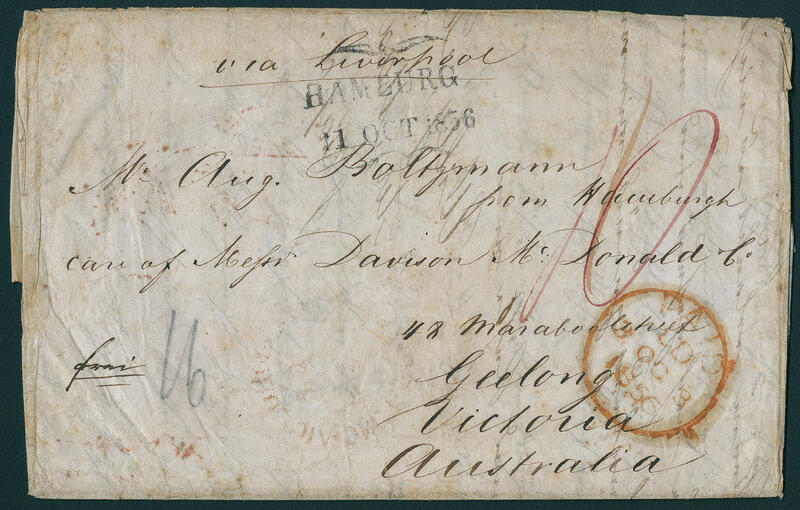 Classic letters from Hamburg to Australia used are extraordinarily rare! 4451 ✉ \"GREETSYHL 19.7. 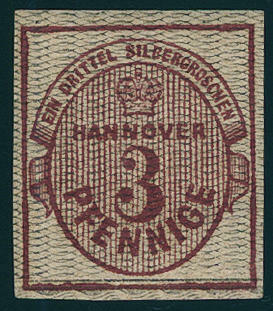 \", still used two ring cancel, twice clear on postal stationery cover German Reich 1 Gr. Small breast shield with additional franking 2 Gr. Small breast shield as accompanying letter for parcels to Esens with arrival postmark. A very nice cover! 4436 ∆ 1 1 Ggr. Black on blue-grey, fresh colors and in perfect condition from right margin of sheet on beautiful white letter piece with perfect, pricked clear red single line cancel \"ESENS\" and additional likewise clear red rectangle cancel \"ESENS 21. JANR. \". 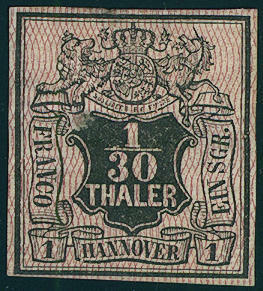 An exception copy of this rare cancellation for the highest standards and the perfect start of a demanding Hanover collection! Photo expertize \"genuine and immaculate\" Berger BPP. 4437 ✉ 7a 1 / 10 Th. 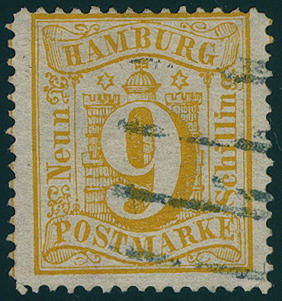 Black, network orange, fresh colors, three sided with wide margins, right with parts of the neighbour, left to the margin line cut, as scarce partly franking on cover with blue rectangle cancel \"Hanover 28. 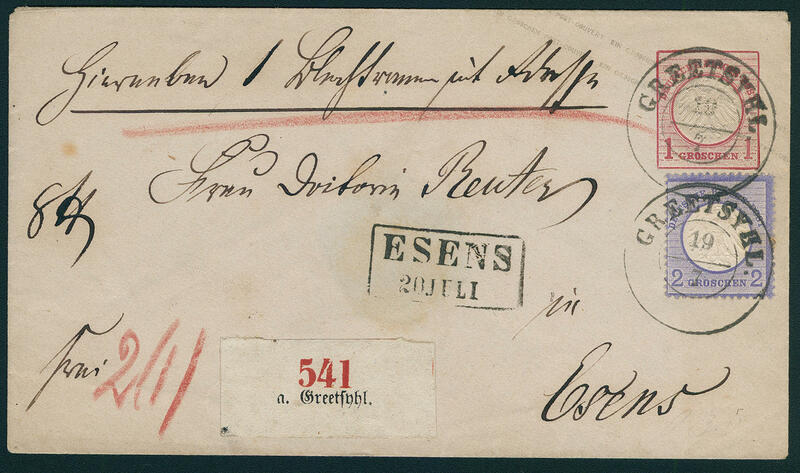 July (1856) \" to Edinburgh / Scotland with handwritten routing indicator \"VIA OSTEND\" with red circular cancel \"P. \" as well red stamp \"PAID 3. JY. 1856. \". Very rare! 4438 8P 3 Pfg., proof with horizontal close black network, fresh colors and with wide margins, unused with original gumming, superb in every respect (choice copy). Rare! 4439 ✉ 9 1 Ggr. 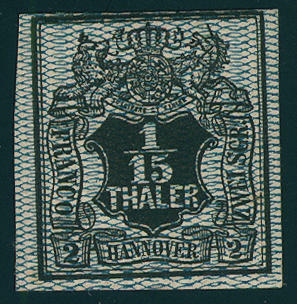 Black, network bright olive green, fresh colors and on all sides good margins with beautiful ornamental border lower margin on cover with blue box cancel of 2 lines \"NEUSTADT A. R. 25. 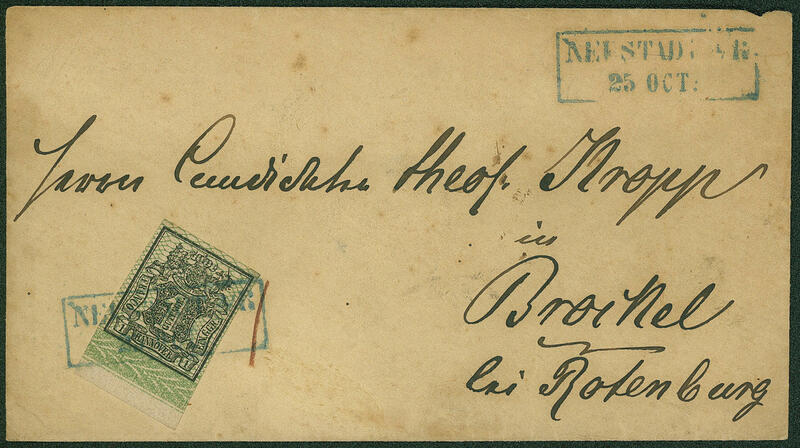 OCT\", to Rotenburg with arrival postmark, cover slight patina, rare! 4440 9P 1 Ggr., proof with vertical network, fresh colors and with wide margins with large parts the original gumming, superb in every respect (choice copy). 4441 10P1 1 / 30 Th., proof with vertical network, fresh colors, on all sides having full to wide margins, reverse thin places, without gum. 4442 10P2 1 / 30 Th., proof with horizontal close network, fresh colors and with wide margins with large parts the original gumming, reverse thin. 4443 11P 1 / 15 Th., proof with horizontal close network, above to the margin line cut, three sided with wide margins, fresh colors, reverse stick, parts the original gumming. Rare!